Rudy's Diesel Performance is proud to announce the release of our new replacement up-pipes. 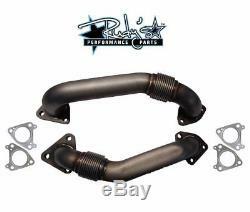 These up-pipes are designed to lower EGT's, reduce drive pressure and accelerate turbo spool-up time- all while maintaining reliability! 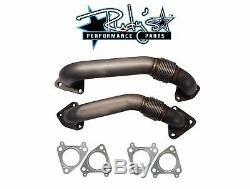 This kit includes (2) up-pipe to turbo gaskets and (2) up-pipe to manifold gaskets. These are all the gaskets necessary to install these replacement up-pipes on your vehicle. Please note that bolts are NOT included. Faster Spool-Up & Increased Performance. Significant Reduction In Exhaust Back Pressure. Free-Flowing Stainless Steel Inner Liner Bellows. 120-inch wall, 2-inch OD Up-Pipes. Note: These race up-pipes do not retain the use of the EGR. 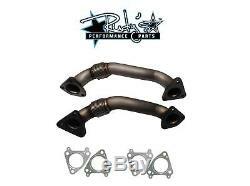 They are for off-road use only and will only work on non-EGR s.
For use with OEM manifolds only. CA Residents: Not legal for sale or use in California on pollution controlled motor vehicles. We value your business and we are not satisfied until you are. Rudy's Performance Parts ships products from multiple warehouses across the country in order to get your products to you the quickest way possible. All of our parts and accessories are returnable and refundable.